DutchAmsterdam.nl — One of Amsterdam’s most unique museums is the EYE Film Instituut Nederland — EYE Film Institute Netherlands. Founded in 1952 as the Filmmuseum, EYE houses an internationally renowned film collection that covers the entire history of cinema — from the very first silent films dating from the late 19th century, up to the latest contemporary digital productions. The Filmmuseum’s predecessor was the Dutch Historic Film Archive, founded in 1946. The museum’s collection, which consists of 46,000 film titles, 35,000 posters, 450,000 stills, 1.900 periodicals and 30,000 books — with more items being added all the time — is the source of inspiration for the institute’s film programs, exhibitions and events. EYE says the most important sections of its collection are the Dutch film collection (the largest in the world), silent film, experimental film, amateur film, company films, animation, mainstream cinema and art house classics. You get the picture, so to speak. If you’re interest in film, you need to visit EYE. From 1972 through the start of 2012 the Filmmuseum was housed in the Vondelparkpaviljoen — an old, atmospheric building located in Vondelpark. There the museum had the use of two small cinemas which yearly drew over 150.000 visitors — many of whom will miss the Old World ambiance of the place (including café Vertigo in the basement of the building). The museum’s new home — at a key location overlooking the IJ harbor behind Amsterdam Central Station — offers state-of-the-art, modern viewing spaces that EYE estimates will draw 200.000 people year to the landmark building, which opens to the public on April 5, 2012. The EYE building features four modern film auditoriums: one with 300 seats, two with 120 seats and one with 80 seats. There is ample room for exhibitions, educational activities and other events. Workrooms, a film lab, a shop and a café complete EYE’s headquarters. A separate building will house the Institute’s restoration, preservation and research activities, as well as the film library. In the summer, EYE’s sunny terrace offers a great view of the busy river IJ, Amsterdam’s waterfront. The IJ (pronounced pretty much like ‘I’ or ‘eye’) has been, and is, undergoing a major transition — with industrial areas being transformed into urban neighborhoods. 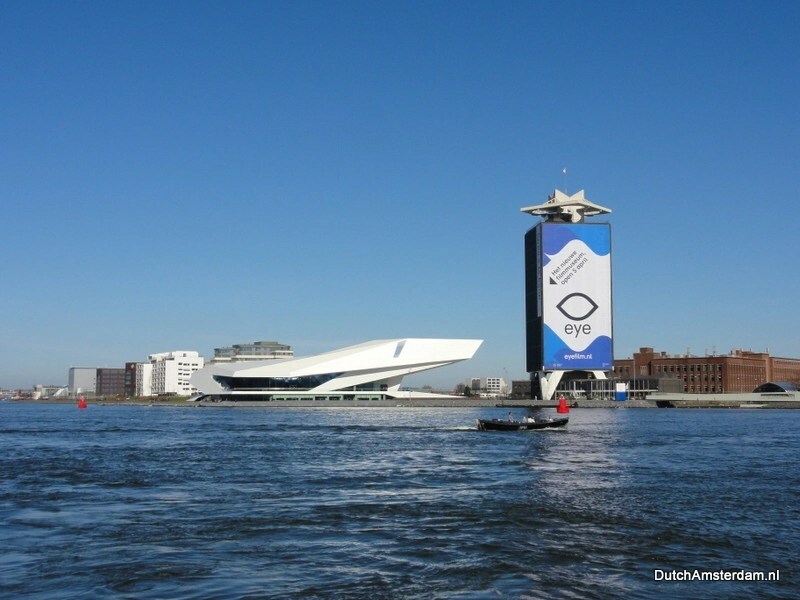 EYE’s new location is in Overhoeks, Amsterdam’s new urban district named after the prominent Overhoeks Tower — now named A’DAM Toren — on the former Shell research site. The uniquely-shaped building was designed by Delugan Meissl Associated Architects, in Vienna. My mother steadfastly refers to it as “the dead seagull,” which is not what the designers had in mind. They reference the fact that film is an illusion created by the interplay of light, space and movement. By way of projection that illusion becomes reality. In the space between land and water, and between the historical city center and Amsterdam Noord’s new developments the building takes on different shapes depending on where you stand. The architects say this way it is in constant ‘dialogue’ with its surroundings. By the way, like most buildings in Amsterdam the foundation of the EYE building rests on pillars driven deep into the sandy bottom: 348 piles, most of them 50-60 centimeters in diameter. Amsterdam’s sandy soil is too soft to build on, which is why the city is built on piles driven deep into the ground until they reach a solid layer of rock or compacted clay. EYE includes four halls: the largest with room for 315 people; the smallest 67. In total EYE has 640 seats vs 160 in the old location. It also has 1200 square meter of exposition space. Oh, see that tower next to the EYE building? That’s the A’DAM toren, which features the A’DAM Lookout — an observation deck that provides you with panoramic views of Amsterdam and beyond. This trailer for a Dutch-language documentary on Amsterdam, city at the IJ, shows the EYE Film Institute Netherlands building still under construction. Also shown are some other new buildings and construction projects. The documentary highlight the opinions — pro and con — of individuals regarding the changing skyline around the IJ.